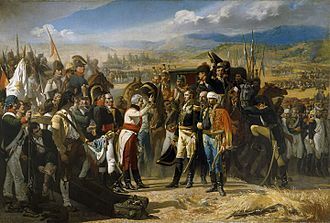 In the Battle of Villagarcia (also known as the Battle of Llerena) on 11 April 1812, British cavalry commanded by Lieutenant-General Sir Stapleton Cotton routed a French cavalry force led by General de Brigade Charles Lallemand at the village of Villagarcia in the Peninsular War. Cotton intended to trap the French cavalry, which was separated by a number of miles from the main body of the French army, by executing simultaneous frontal and flank attacks. The plan came close to disaster when the forces making the frontal assault pushed forward prematurely. The situation was saved by the timely arrival of John Le Marchant's force on the French left flank. The recent fall of the French occupied fortress city of Badajoz, on 6 April 1812, allowed the Anglo-Portuguese forces under Wellington to take the strategic offensive. Prior to moving the bulk of his forces north where he would launch his Salamanca campaign Wellington entrusted a considerable proportion of his available cavalry to a force under General Sir Rowland Hill who was ordered to drive the retreating French army of Marshal Soult, who had failed in his attempt to relieve Badajoz, back into Andalusia to the south. The French rearguard under General D'Erlon were under orders to fall back towards Seville if pressed hard. Hill's cavalry, under Sir Stapleton Cotton, were indeed pressing those French forces still remaining in the province of Extremadura hard. Stapleton Cotton's cavalry consisted of John Le Marchant's heavy brigade (3rd and 4th Dragoons and 5th Dragoon Guards), John Slade's heavy brigade (1st Dragoons, and 3rd and 4th Dragoon Guards) and Frederick Ponsonby's (in temporary command due to General Anson's absence) light brigade (12th, 14th and 16th Light Dragoons). Only Ponsonby's brigade and the 5th Dragoon Guards were involved in the fighting. The French cavalry force, attached to D'Erlon's two infantry divisions, commanded by General François "Charles" Lallemand was composed of the 2nd Hussars and the 17th and 27th Dragoons. On the evening of 10 April 1811, General Cotton climbed the steeple of a church in Bienvenida. He knew that the French were occupying Llerena and saw that there were considerable numbers of French cavalry five miles closer to him near the village of Villagarcia. Cotton decided that he should attempt to trap the French cavalry with his superior forces. During the night he despatched Ponsonby with the 12th and 14th Light Dragoons to probe the Villagarcia area, whilst Le Marchant was sent on a circuitous march to get on the French left flank and, it was hoped, cut off their retreat. Slade was also instructed to concentrate his brigade on Bienvenida, though he seems to have been tardy in moving. Cotton retained the 16th Light Dragoons as a reserve. At some time during the night Cotton realised that Ponsonby's force might alert the French before Le Marchant was within striking distance and despatched an aide-de-camp with orders to halt the light cavalry; unfortunately the order arrived too late. Two squadrons of the British light cavalry had forced the French vedettes out of the village of Villagarcia but, around dawn, had run into the full force of the French cavalry and were then chased back. Ponsonby subsequently found his two regiments faced by the three strong regiments under Lallemand and had to make a controlled withdrawal whilst skirmishing against heavy odds. Following his orders, Le Marchant had moved his brigade though the night over tortuous terrain for a considerable distance. Coming down from rugged hills bordering the plain where the action was fought Le Marchant and the 5th Dragoon Guards had pulled considerably ahead of the other two regiments of the brigade. Le Marchant noticed, looking through the trees of the wood his men were moving through, that French cavalry, drawn up in two deep columns of squadrons, were pushing the six squadrons of light dragoons back towards a narrow ravine flanked by stone walls. Le Marchant realised that an immediate charge was needed, before Ponsonby's squadrons were forced into the congested and broken ground to their rear. Lallemand, it is recorded, caught a glimpse of red-coated figures in the woods to his left and rode to alert General Peyremmont, who was leading the 2nd Hussars. Peyremmont scorned Lallemand's concerns, saying that the British dragoons were probably a small detachment who had lost their way. At this point the advantage that the French had enjoyed in the action was suddenly reversed. Le Marchant led his dragoon guards out of the woods and they formed their ranks whilst accelerating into the charge. The 5th Dragoon Guards attacked with their squadrons in echelon, their left refused, and struck the deep and exposed left flank of the French formation to considerable effect. Simultaneously with Le Marchant's charge the 16th Light Dragoons, led by Cotton, appeared to Ponsonby's right-rear; they jumped a stone wall in line, and also charged. The French cavalry were thrown into instant confusion and were swiftly broken. 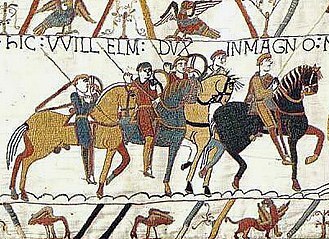 The British pursuit, continuing to inflict casualties and take prisoners, was conducted all the way back to the walls of Llerena where the bulk of D'Erlon's force was concentrated. The French rallied briefly at a ditch halfway to Llerena, but they were outflanked by the 16th Light Dragoons and were forced into flight once more. A few hours later the French abandoned Llerena and continued their retreat out of Extremadura. The French lost 53 killed or wounded, plus 136 captured (including 4 officers - one a lt. colonel) and were induced to leave the province of Extremadura. The British lost 51 troopers killed or wounded. Cotton had shown initiative in conceiving a plan to trap the French cavalry, however, the plan was wholly reliant on the timing of the movements on the flanks coinciding with those of the centre. As a result, it was probably rather too complex and came dangerously close to breaking down in execution. 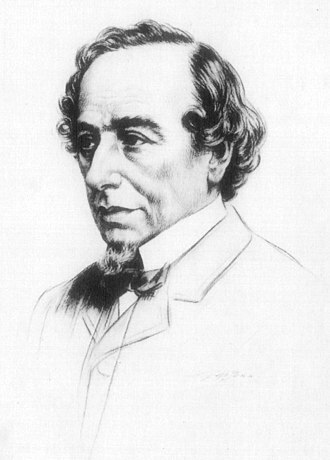 However, Cotton was flexible in extemporising once his original plan was rendered irrelevant when his central force made its presence known to the enemy too soon. Slade's heavy brigade did not make an appearance at all. Le Marchant, in his first large-scale action as a general, proved himself as able a commander of cavalry in the field as he was a military innovator and educator. The discipline and drill of the 5th Dragoon Guards in delivering a textbook charge after moving out of woodland, where they would have been unable to form their squadrons properly, is noteworthy. ^ Le Marchant, D., p 213. Le Marchant, D., Memoirs of the Late Major General Le Marchant Memoirs of the Late Major General Le Marchant, London (1841). Thoumine, R.H. Scientific Soldier, A Life of General Le Marchant, 1766–1812, Oxford U. Press (1968). The 5th Dragoon Guards was a cavalry regiment in the British Army, first raised in 1685 as the Duke of Shrewsburys Regiment of Horse. It was renamed as the 5th Regiment of Dragoon Guards in 1788 and it saw service for two centuries, including the First World War, before being amalgamated with The Inniskillings, to form the 5th/6th Dragoons in 1922. It fought at the Battle of the Boyne in July 1690 and it charged the French and made them to fall back at the Battle of Beaumont in April 1794 during the French Revolutionary Wars. 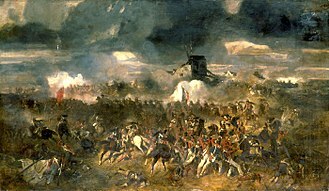 In 1804 it took the title 5th Regiment of Dragoon Guards for Princess Charlotte and it saw action at the Battle of Salamanca in July 1812, Battle of Vitoria in June 1813 and Battle of Toulouse in April 1814 during the Napoleonic Wars. 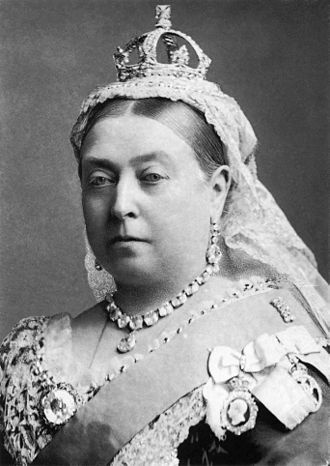 It took part in the charge of the Heavy Brigade at the Battle of Balaclava in October 1854 during the Crimean War, the regiment saw action at the Battle of Elandslaagte and the Battle of Lombards Kop in October 1899 during the Anglo-Boer War. 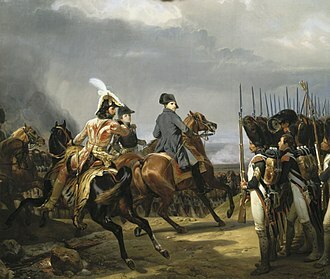 After failing to force a surrender, Wellington withdrew his army when the French mounted a successful relief effort by combining the armies of Marshals Nicolas Soult and Auguste Marmont. 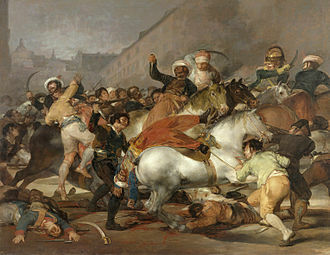 The action was fought during the Peninsular War, part of the Napoleonic Wars, Badajoz is located 6 kilometres from the Portuguese border on the Guadiana River in western Spain. 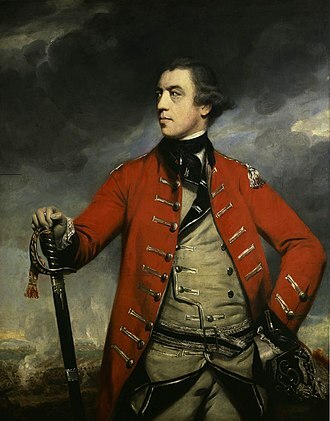 While Wellington faced Marshal André Massénas Army of Portugal in the north, Beresford invested the city in April but Philippons garrison successfully fended off his attacks. 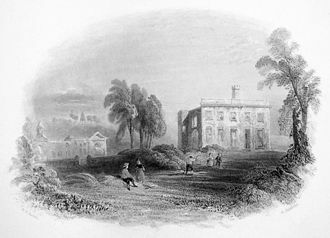 The siege was lifted while the Battle of Albuera was fought on 16 May. Though both sides suffered casualties, Beresford emerged the victor and Soult retreated to the east. Wellington brought reinforcements from the north and resumed the siege, Massénas replacement Marmont brought large forces south to join Soult. 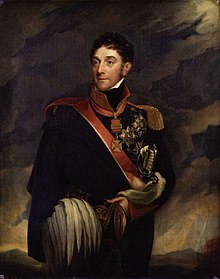 The British commander lifted the siege after being menaced by the numerically superior French army led by Soult, hoping to assist Marshal André Massénas invasion of Portugal, Emperor Napoleon ordered Marshal Nicolas Soult to act. Accordingly, Soult set out in January 1811 with 13,500 foot soldiers,4,000 horse, in a preliminary operation, Soult captured Olivenza in a two week siege that ended on 23 January. The French seized 4,161 Spanish prisoners and 18 guns for a loss of only 15 killed and 40 wounded. On 27 January, Soults army invested Badajoz, despite the interference of a 15, 000-man Spanish relief army, the results were all the French could have hoped for. On 19 February, Soult sent Marshal Édouard Mortier to deal with the Spanish army, Mortier won a crushing victory in the Battle of the Gebora. The Spanish lost 850 killed and wounded plus 4,000 men,17 guns, turning to the siege, Soult forced a surrender on 11 March. The 4, 340-man Spanish garrison plus 2,000 fugitives from the Battle of the Gebora lost about 1,000 killed and wounded while the rest became prisoners, the French sustained 1,900 casualties in the siege. Leaving Mortier and 11,000 soldiers to hold Badajoz and environs, Mortier besieged and captured Campo Maior on 21 March. Badajoz is the capital of the Province of Badajoz in the autonomous community of Extremadura, Spain. It is situated close to the Portuguese border, on the bank of the river Guadiana. The population in 2011 was 151,565, conquered by the Moors in the 8th century, Badajoz became a Moorish kingdom, the Taifa of Badajoz. Spanish history is reflected in the town. 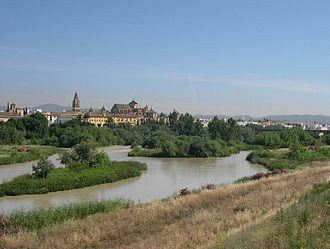 Badajoz is the see of the Roman Catholic Archdiocese of Mérida-Badajoz, prior to the merger of the Diocese of Mérida and the Diocese of Badajoz, Badajoz was the see of the Diocese of Badajoz from the bishoprics inception in 1255. The architecture of Badajoz is indicative of its tempestuous history, even the Badajoz Cathedral, built in 1238, resembles a fortress, Badajoz is home to the CD Badajoz and AD Cerro de Reyes football clubs and the AB Pacense basketball club. 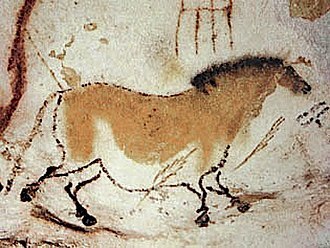 It is served by Badajoz Railway Station and Badajoz Airport, Archaeological finds unearthed in the Badajoz area have been dated to the Bronze Age. Megalithic tombs are dated as far back as 4000 BC, while many of the steles found are from the Late Bronze Age, other finds include weapons such as axes and swords, everyday items of pottery and utensils, and various items of jewellery such as bracelets. Archaeological excavations have revealed remnants from the Lower Paleolithic period, artifacts have been found at the Roman town of Colonia Civitas Pacensis in the Badajoz area, although a significant number of larger artifacts were found in Mérida. 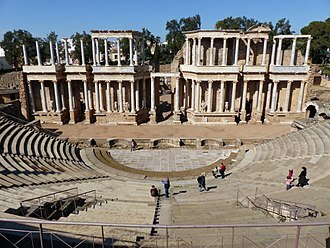 Badajoz attained importance during the reign of Moorish rulers such as the Umayyad caliphs of Córdoba, from the 8th century, the Umayyad dynasty controlled the region until the early 11th century. The official foundation of Badajoz was laid by the Muladi nobleman Ibn Marwan, around 875, under Ibn Marwan, the city was the seat of an effective autonomous rebel state which was quenched only in the 10th century. In 1021, it became the capital of a small Muslim kingdom, Badajoz was known as Baṭalyaws during Muslim rule. The invasion of Badajoz by Christian rulers in 1086 under Alfonso VI of Castile, in addition to an invasion by the Almoravids of Morocco in 1067, Badajoz was invaded by the Almohads in 1147. Badajoz was captured by Alfonso IX of León on 19 March 1230, shortly after its conquest, in the time of Alfonso X the Wise of Castile, a bishopric see was established and work was initiated on the Cathedral of San Juan Bautista. The 14th Kings Hussars was a cavalry regiment in the British Army, first raised in 1715. It saw service for two centuries, including the First World War, before being amalgamated with the 20th Hussars to form the 14th/20th Kings Hussars in 1922 and it took part in the Battle of Preston in November 1715 after which it escorted some of the rebels to Lancaster Gaol. The regiment was sent to Ireland in 1717 and remained there until 1742, the regiment returned to Ireland in 1747 and it was formally renamed as the 14th Regiment of Dragoons in 1751. The regiment was renamed for Princess Frederica in 1798 as the 14th Regiment of Dragoons, the regiment was dispatched to Lisbon in December 1808 to join Sir Arthur Wellesleys Army which was engaged in the Peninsular War. The regiment fought at the Second Battle of Porto in May 1809 during which one of the French brigade commanders, the regiment advanced into France performing a supporting role at the Battle of Orthez in February 1814 and at the Battle of Toulouse in April 1814. The regiment served in Ireland between January 1816 and June 1819 and between April 1825 and March 1828. The regiment was renamed in July 1830, to mark the coronation of William IV as the 14th Regiment of Dragoons and it was dispatched to India in May 1841. 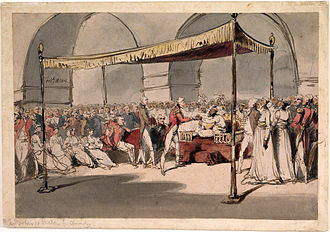 The regiment marched from Kirkee in the west of the country to Ambala in the north of the country through the winter of 1845 during the First Anglo-Sikh War. 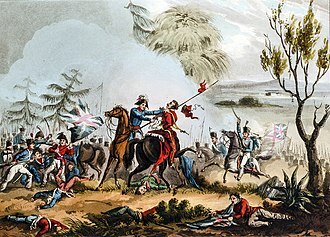 The commanding officer of the regiment, Colonel William Havelock, led a charge, apparently without orders and his leading troopers were surrounded and cut down. After a further charge failed, Brigadier Charles Cureton, the commander of the division to which the troops belonged, galloped up. Cureton himself was killed by musket fire. The regiment were routed at the Battle of Chillianwala in January 1849 and it took part in an expedition under Lieutenant-General Sir James Outram against Persia in spring 1857 during the Anglo-Persian War. The regiment returned to India in May 1857 and took part in the Central Indian campaign during 1858 in the stages of the Indian Rebellion. The 3rd Dragoon Guards was a cavalry regiment in the British Army, first raised in 1685 as the Earl of Plymouths Regiment of Horse. It was renamed as the 3rd Regiment of Dragoon Guards in 1751 and it saw service for two centuries, including the First World War, before being amalgamated into the 3rd/6th Dragoon Guards in 1922. In 1746 it was ranked as the 3rd Dragoon Guards, shortly thereafter, in 1765, it took the title 3rd Dragoon Guards, for the future George IV. It took part in the suppression of the Bristol riots in 1831 and, after service in India, the regiment was employed chasing the elusive General Christiaan de Wet in spring 1901 during the Second Boer War. It retitled as 3rd Dragoon Guards in 1921, and was amalgamated with the 6th Dragoon Guards to form the 3rd/6th Dragoon Guards the following year, lord Robert Manners 1782 Gen. Philip Honywood 1785 Lt-Gen. Sir William Fawcett 1804 Gen. Richard Vyse 1825 Gen, sir William Payne-Gallwey, 1st Baronet 1831 Gen. Samuel Hawker 1839 Lt-Gen. The 4th Queens Own Hussars was a cavalry regiment in the British Army, first raised in 1685. It saw service for three centuries, including the First World War and the Second World War and it amalgamated with the 8th Kings Royal Irish Hussars, to form the Queens Royal Irish Hussars in 1958. 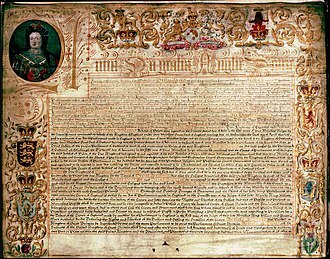 The regiment was first raised by the Hon, the regiment transferred its allegiance to King William III in February 1689 and fought the depleted forces of James II in Scotland in that year. The regiment saw action at the Battle of Steenkerque, where it suffered losses, in August 1692. The regiment was designated a light dragoons in 1818, becoming the 4th Regiment of Dragoons, the regiment next saw action, as part of the light brigade under the command of Major General the Earl of Cardigan, at the Battle of Alma in September 1854. The regiment was in the line of cavalry on the right flank during the Charge of the Light Brigade at the Battle of Balaclava in October 1854. The regiment lost 4 officers and 55 men in the debacle, private Samuel Parkes was awarded the Victoria Cross during the charge for saving the life of a Trumpeter, Hugh Crawford. 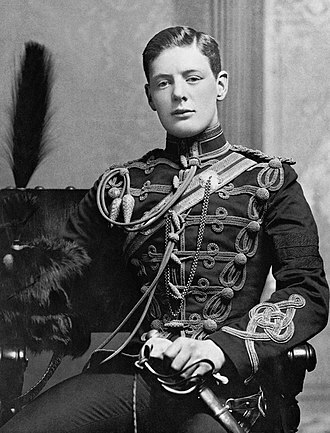 The regiment became the 4th Hussars in 1861 and Winston Churchill was commissioned as a cornet in the 4th Hussars in February 1895. The regiment took part in the Great Retreat in September 1914, the First Battle of Ypres in October 1914 and the Second Battle of Ypres in April 1915. The regiment was posted to the Middle East arriving on 31 December 1940, as the rearguard in the Corinth Canal Bridge action the regiment was overrun and surrendered losing all senior officers and over 400 men as prisoners of war. In June 1941, the regiment was reconstituted in Cairo and rejoined the 1st Armoured Brigade, the regiment fought with distinction in the Italian campaign during the allied advance into the Axis territories. Winston Churchill became Colonel-in-Chief of the Regiment in 1941 and served until amalgamation, after the Second World War, the 4th Hussars deployed to Lübeck in Germany in March 1947 from where the regiment was sent to serve in the Malayan Campaign in September 1948. It returned to the UK in December 1951 and was posted to Caen Barracks in Hohne in September 1953. Salamanca's Roman bridge was commanded by the La Merced fort. Battle of the Boyne between James II and William III, 11 June 1690, Jan van Huchtenburg. The Battle of Vigo Bay, by Ludolf Backhuysen. Plinth of Ponsonby's Column, a monumental column erected in Valletta in 1838. The column was destroyed by lightning in 1864, and only the plinth survives today.